Figure 1. 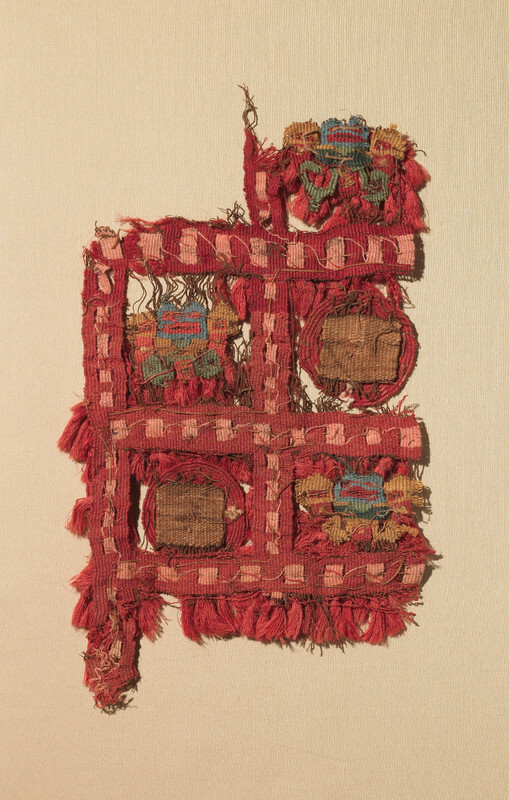 This fragment of a high-level Inka administrative tunic represents the idea of qumpi, or the finest cloth. Michael C. Carlos Museum, 2002.1.128. Photo by Bruce M. White, 2014. The Inka referred to the feminine principle, Pachamama, as "the long dress that drags on the ground" (Dransart 1992; Stone 2007a: 412;). This is a deceptively complex idea that reveals much about Inka, and by extension Andean, thought. It especially highlights the importance of textiles in the hands and on the bodies of women. In what I also propose to call the “cosmic dress,” land and cloth were seen as one and both were considered fundamentally — although not exclusively — female. Reinforcing this idea, the Inka heir apparent walked through the city of Cusco stepping only on a path of stunning tapestries — in a culture which eschewed rugs — as he went to marry and accede to the throne in a dual ceremony. Thus, cloth represented the entire earth which was symbolically now his empire, at the same time as he became a complete being, masculine joined with feminine (known as warmiqhari or “woman-man,” the complete pair). Figure 2. 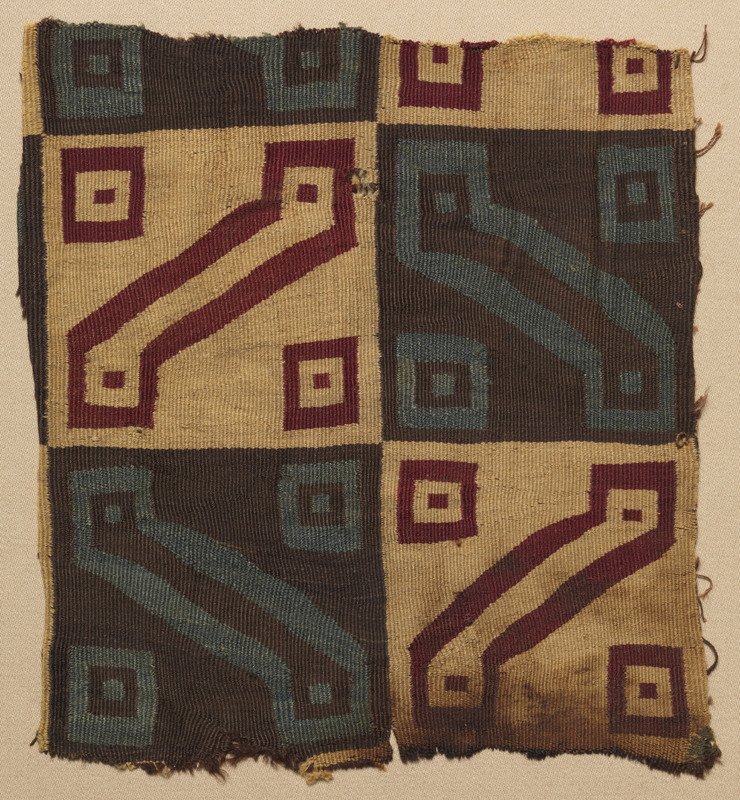 The Inka (and some of their predecessors) wrote in a textile format known as the khipu. 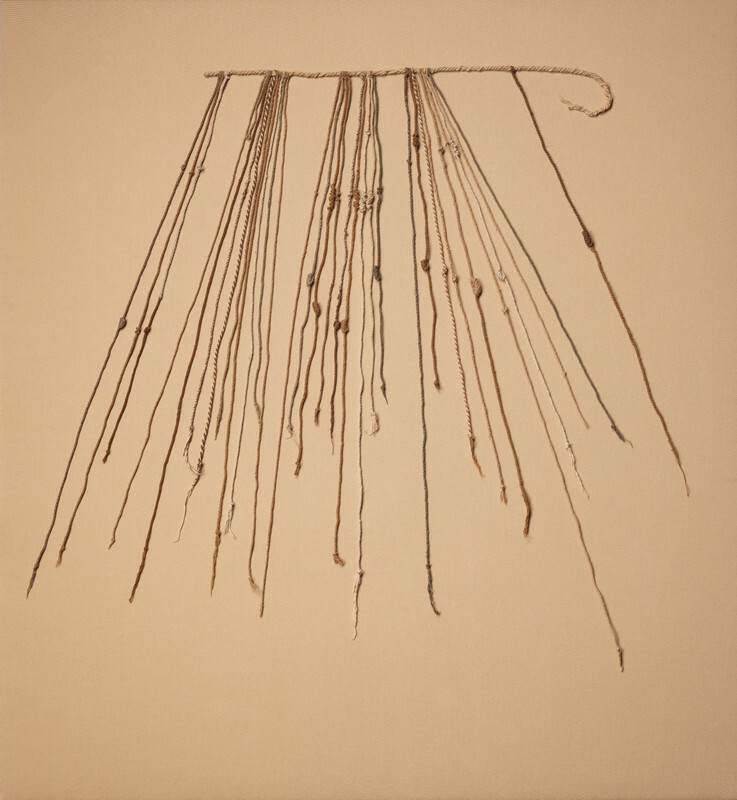 These elaborate knotted devices show how truly important the fiber medium was in the ancient Andes. Michael C. Carlos Museum, 2002.1.130. Photo by Bruce M. White, 2016. The ruler wore a unique and splendid tunic that contained myriad patterns, which I have argued signaled not what has already been conquered, but rather what was potentially to be subjugated (Stone 2007a). In the Inka political system, the heir inherited the power but none of the territory that his predecessor had brought into the empire, forcing him to conquer more territory in order to expand the empire and garner tribute (ibid., 407). His wildly geometric tunic also echoed how the creator being, Viracocha, gave all the people of the earth their distinctive geometric patterns to wear before he sent them underground to reemerge in their proper places (Urton 1999,36). Thus, the Inka constructed a complex conceptual grouping of land, people, and patterned cloth. Pachamama is usually translated as Mother Earth, but more accurately should be called the Creatrix of All Space/Time. Mama certainly makes her female and specifically a fertile, responsible, adult female, equally capable of generating two precious entities: children and cloth. Thus, the feminine principle not only weaves and wears long dresses, but more accurately, she is conceptualized as a huge cloth in a culture that understands how much time, skill, effort, and fertility it takes to weave on a large scale. Weaving and natural abundance go hand in hand since widespread fertility of the cotton and the dye plants, plus the camelids (see below), are required to produce cloth. On a practical level, if earthly weather and soil conditions are not favorable, there will be little food and less time leftover for women to weave. Earth, cloth, and females are truly intertwined. Figure 3. A beautifully woven sling, nominally used to fling stones at enemies’ heads, exemplifies the idea of the “art-tool” since it expresses function and aesthetics in equal measure. Michael C. Carlos Museum, 2002.1.124. Photo by Michael McKelvey. Pacha, though often translated simply as Earth, means more than that: since this universal feminine is a dress that drags on the ground, clearly it cannot simply be the ground itself. The earth lies under this dress, like a woman's body under her garments. This suggests that the “cosmic dress” may be thought of as the plants, rivers, mountains, and other colorful surface features that “blanket” the earth and make up the terrestrial world. Though it may be a surface, the long earthly garment is a dress, i.e., it is three-dimensional just like the Inka wrap-around dress. A large rectangle of cloth called an aksu encircled an Inka woman’s body (still a traditional garment today (see Capturing the Rainbow). The continuous and cyclical nature of such a vast dress echoes the rounded, seemingly endless natural world experienced in the Andes, with the mountains very much like a woman's rounded body and breasts, and its waters like wombs filled with amniotic fluid and blood. In fact, the Inka worldview has been called hydraulic, meaning energy and water flow between all sorts of entities (Classen 1993, 15). For example, when the Inka ruler drinks, all peoples’ thirst is considered to have been slaked (Allen 2002, 196-197). In the wet season the Andean landscape is fertile, transformed from dry, tan, brown, and withered into moist, green and even red (quinoa [Chenopodium quinoa] and kiwicha [Amarantha caudatus]) (National Research Council 1989, 142). Women’s fertility is also a matter of wet seasons, with menses/amniotic fluid conceptualized as the “rains” that ultimately produce offspring. Like dresses that combine many colors, the earthly “cosmic dress” blooms with color during its fertile periods. The wet season is a time period in the solar year, yet it expresses itself spatially through a blanket of lush plants, bubbling streams, and vivid color. Figure 4. 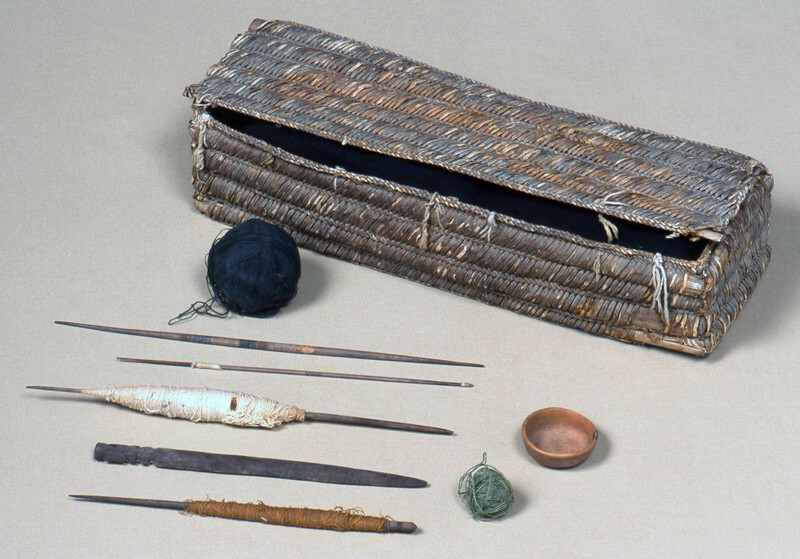 A thousand-year-old woman’s workbasket from the central coast of what is now Perú contained her tools. Many weaving tools throughout the ancient Americas were sculpted or elaborated with paint, or with incised designs (figs. 5-7), making them “art-tools.” Michael C. Carlos Museum, 2002.1.126A/U. Photo by Michael McKelvey. Importantly, the term pacha incorporates both space and time, two aspects of the world that were undifferentiated in Andean and other indigenous American cultures (as now recognized in modern Quantum Physics). Indicating that it is both spatial and temporal, anthropologist Catherine Allen translates pacha as "world-moment" (1998, 22). She explains that the world is a larger category and the particular moment a subset of it; worlds are layered and contain one another. She reports, “every named place is a pacha, that is, a self-contained microcosm, which itself may contain other, as a mountainside contains ridges, which contain hillocks, ravines, and rock outcrops” (ibid.). That the “world-moment” is equated with a long dress indicates another aspect of the long-recognized primacy of the fiber arts in the Andean tradition. Like pacha, actual lengthy adult dresses take up space, have a spatial extension, and simultaneously reify (materialize) the huge expenditures of time required to create them. Weaving takes place row by row in a slow unfolding of complex patterns. Often a modern woman can only accomplish an inch or so of weaving a day. This is partly because of the elaborate patterns and high thread counts involved, but also because women rarely can devote all their time to their art among the other responsibilities of being wives, daughters, mothers, and grandmothers, as well as perhaps merchants and participants in agriculture and myriad other essential duties. Thus, cloth and space/time are deeply analogous and largely feminine prerogatives. Figure 5. 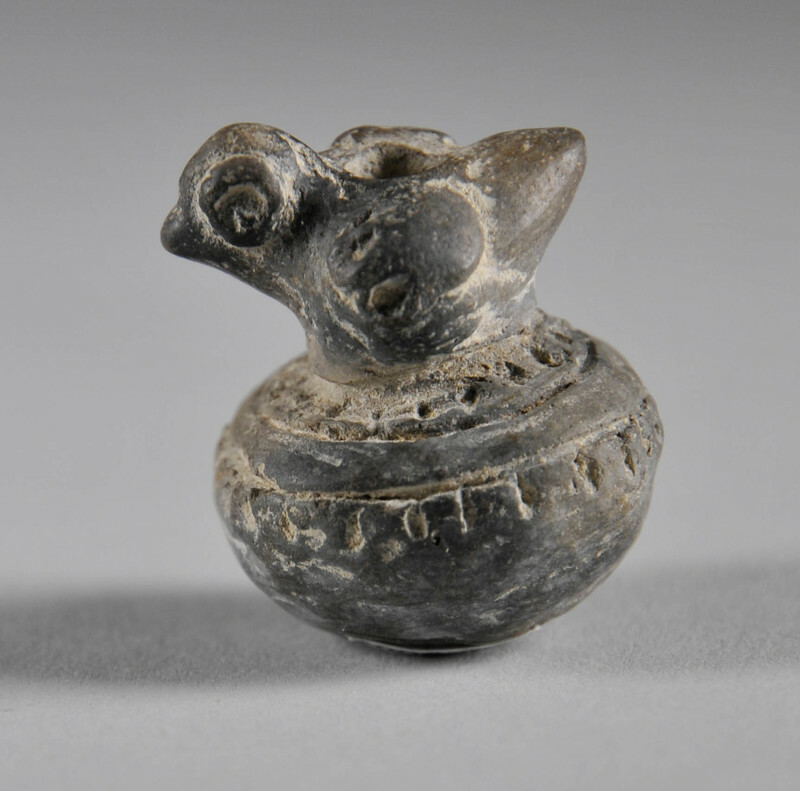 This Chimú-Inka blackware spindle whorl was sculpted from clay into the form of a bird. Spindle whorls are threaded onto stick-like spindles to aid in the thread spinning process. Michael C. Carlos Museum, 2006.5.34. Photo by Stacey Gannon-Wright. In terms of the actual textiles that would fall into the womanly arts of qumpi, the finest ancient Andean textiles, includes: fine thread which allows for fine and detailed weaving with high-thread counts; overcoming the natural challenges of the medium, such as flatness and the grid of warp and weft; utilizing rare materials, usually those of consummate softness; achieving bright dyed colors, especially red and blue; and, in some eras, the addition of brilliant feathers and sparkling pieces of metal to cloth surfaces. It is important to note that most of the pieces in the ancient Andean part of the exhibition are not Inka per se; the only actual Inka example of qumpi is an “Inka key” tunic fragment (fig. 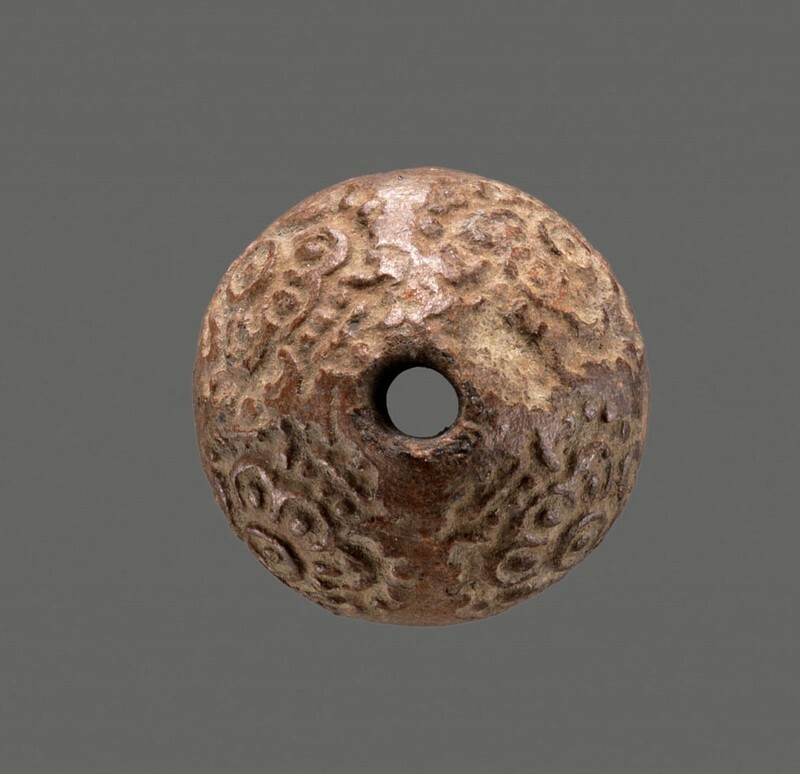 1), though knot-writing devices known as khipu (fig. 2) are also characteristic of the Inka Empire. Thus, the issue arises as to whether it is useful or appropriate to apply later peoples’ terms to interpret earlier ones. While not a perfect situation, it is rare to know who spoke what and we do not have dictionaries of all of the pre-Inka languages since over one hundred and sixty were spoken by people across the empire (Kaufmann 2006, 4). We have better understanding of Aymara, spoken mainly in Bolivia still today, and linguists identify a possible common ancestor of both Quechua and Aymara (Mannheim 2013, 37). However, there is agreement that Quechua existed before the imperial Inka took it up as the lingua franca (Mannheim 2013, 47). Therefore, the information available from Quechua does not simply apply to the imperial Inka, but rather informs a more widespread and earlier expanse. I will aver that in lieu of every language and its words being known, and having the luxury to apply specific languages only to the textiles made by those speakers, it remains productive to look at the range of Andean textiles in light of the key ideas that lie behind the Quechua concepts. Figure 6. A particularly elaborate Mesoamerican spindle whorl contains the key divinity, the Feathered Serpent, that governs rebirth. Michael C. Carlos Museum, 2006.5.25. Photo by Bruce M. White, 2016. The Inka were the capstone of the ancient Andean cultures, not the same as others before but building on their foundations literally and figuratively (e.g., Schreiber 1987; Cardinal-Pett 2016, 117). Inka ideas and art remain deeply Andean, albeit writ large on the imperial scale: they are still based on the challenging landscape, on reciprocity (see the discussion of ayni in Dialogues in Thread) and movement from place to place, among other features (Stone 2012, 194-196). Their ideas apply seamlessly to the textile medium, understandable since it was so important to all Andean cultures. Thus, the category of qumpi (and the related ideas of ayni, tinku, ukhu, and q’iwa covered in Dialogues in Thread) illuminates the values and practices not only of the Inka but of their forebearers and descendants as well. The "best of the best" was a category of cloth separate from coarse, everyday cloth, known as awaska. This fundamental qumpi-awaska dichotomy describes the relationship of superior to inferior, of skillfully crafted and time-consuming to low quality and rushed. Indeed, Inka subjects barely had time left over from the state’s tribute demands to weave for themselves (McEwan 2008, 90). It could almost be allied to our “art” versus “craft” distinction, even though both cloth types had function; qumpi is more like “art-cloth” (along the lines of Mark Miller Graham’s “art-tool” concept ). “Art-tool” is a term that was first coined in relation to lower Central American material culture, to point up how a functional tool takes on a ceremonial aspect: a hand axe for chopping vegetation becomes a jadeite pendant and a grinding table for processing seeds into flour becomes a sculptural tableau (Stone-Miller 2002, 146). I would add the term “art-cloth” to encompass the beautifully worked Andean slings that are worn as headbands (fig. 3). Clearly function does not obviate artistry in the ancient Americas; rather, those aspects coexist and complement one another. Figure 7. Four flower motifs adorn this tiny spindle whorl, probably denoting the spinner’s birth name “4 Flower.” Michael C. Carlos Museum, 1991.2.179. Photo by Bruce M. White, 2014. Textile implements can be considered “art-tools” as well. More than one hundred Late Intermediate Period (ca. 1000-1470 AD) workbaskets have been discovered from the Central Andes (fig. 4), the scientifically excavated ones all found in the graves of women (Boytner 2006, 68). These well-woven, rectangular, reed baskets contain spindles and whorls, balls of yarn in various colors, small bowls used to support the spindle as it rotates during the production of fine thread, and other items both beautiful and practical. 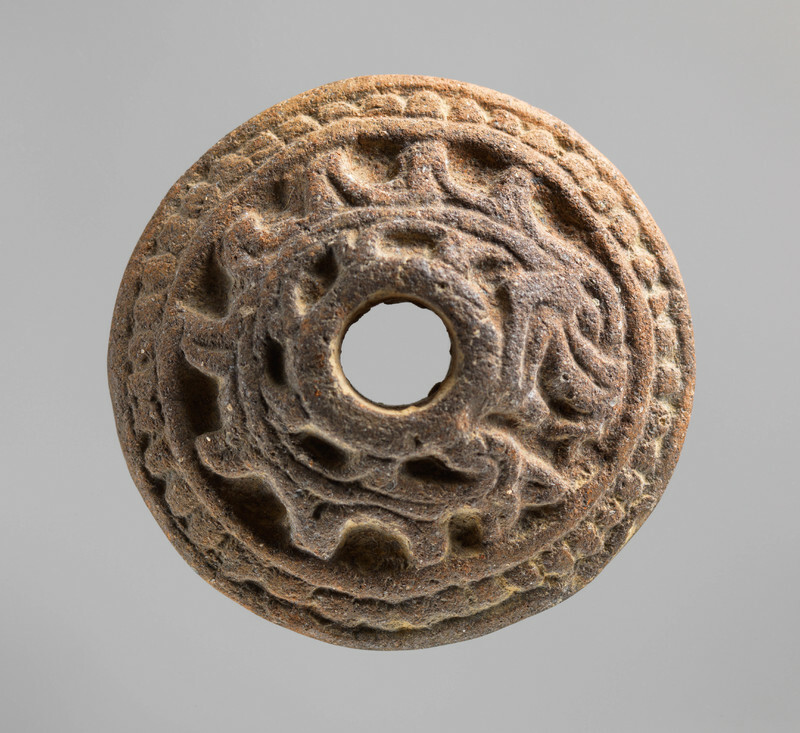 Often Andean spindles are painted; likewise, spindle whorls may be incised and the designs then filled in with white clay so that they pop visually or molded into figures such as birds (fig. 5); and some battens are elaborately carved at the ends (fig. 4, lower left two items). Clearly the elaboration of functional items lies at the heart of the Andean aesthetic as well as the Central American ones. Figure 8a. Besides tools used to spin thread, those for weaving were highly aestheticized in ancient Mesoamerica, such as this Mixtec batten with a complicated scene carved into its surface. Michael C. Carlos Museum, 1994.18.13. Photo by Michael McKelvey. Figure 8b. Drawing by Georgia Clark. In ancient Mesoamerica, spindle whorls may become miniature works of art decorated with feathered snake deities, sun diadems (fig. 6), and even flowers that connote the spinner’s birth name (Stone-Miller 2002, 51). A series of bone battens (wide and flat sticks with pointed ends used to pack threads down and pick up particular ones to make patterns) were found in royal Mixtec graves from Oaxaca in modern-day Mexico (fig. 7). The Carlos is lucky enough to have one of these in its collections. Its complex scene has been carefully decoded (Stone-Miller 2002, 46-47), but in general features a deceased person being honored by others as he descends into the Underworld. Such a bone object might never have been used at all — the surface of a utilitarian batten should be smooth or it will catch strings as it is manipulated — and so is elevated to a symbolic textile tool, or what is called an “art-tool” (Graham 1992, 167). Like qumpi, the best tools are miniature works of art and were either used to make qumpi or imply that higher function. Figure 9. 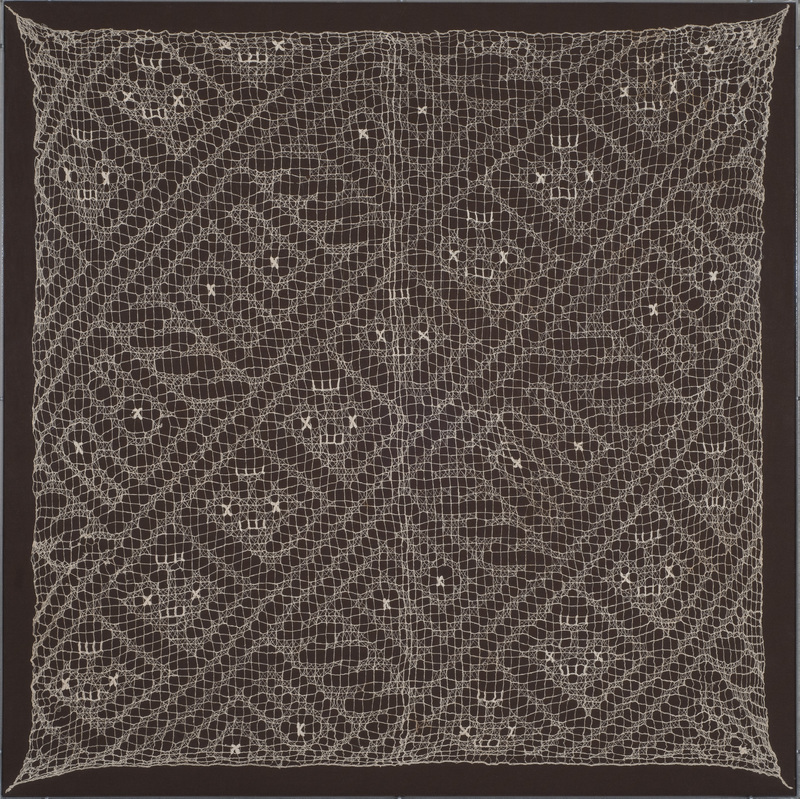 A woman weaver, like the one who owned the workbasket seen in figure 4, would have worn a headcloth such as this folded on her head, according to images of weavers teaching their daughters their skills (in fiber sculpture vignettes like figure 10). Michael C. Carlos Museum, 1989.8.163. Photo by Michael McKelvey, 2017. Extending the “art-tool” idea to its logical conclusion, Andean qumpi or “art-cloth” exceeds all other textiles and even other media in value. In cultures that were truly textile literate, even from afar, viewers could probably readily identify especially complex techniques, difficult colors to dye, the sheen of feathers, and overall elaboration. A big, beautiful colorful, intricate, garment may have been marginally functional to keep off sun, wind, rain, or cold, though that was not its primary purpose. However, usually elites’ cloth was so delicate, such as the cobweb of the Chancay woman’s headcloth made from single threads (fig. 9), that it defied much utilitarian wear at all. Single threads have only been spun, not plied, and as a result they are thin, kink up, and break easily. Such pieces proclaimed the wearer’s great status and formidable control over others, Nature’s bounty, and life force, even on rare formal occasions. The expenditure of large quantities of time and skill always mark a culture’s preferred media and textiles prodigiously consume both. However, in the Andes time and skilled crafting were taken to the extreme. For example, Anne Paul estimated (conservatively) that the woven and copiously embroidered cloths for a Paracas-style mummy bundle took from 6,000 to 29,000 hours to accomplish (Paul 1991, 176). 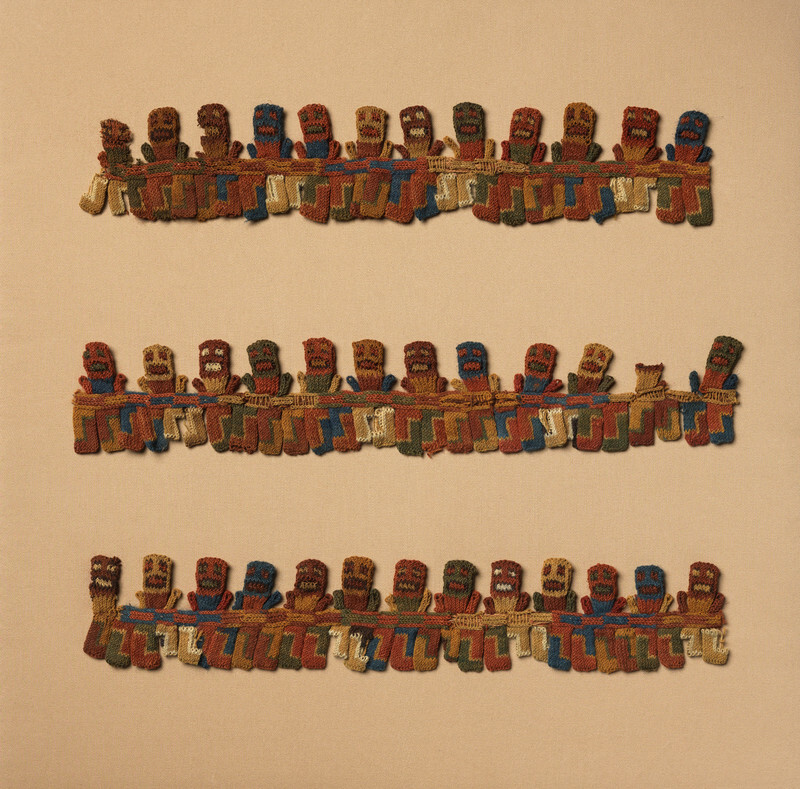 James Vreeland estimated that 4,442 hours of continuous spinning and plying of thread went into an astonishing sixty-square-meter Nasca funerary cloth (Vreeland 1977, 178). Figure 10. This tiny fiber figure of a well-dressed woman measures only 30.6cm tall, making the creation of her miniature clothing quite a challenge. Michael C. Carlos Museum, 2002.1.147. Photo by Bruce M. White, 2014. While it takes time and dedication to weave such enormous numbers and sizes of textiles, equal skill is evinced in intricate patterning on normal-sized garments and even in miniature cloths. The fiber figural sculpture in the Carlos collection wears an entire outfit of qumpi, her blouse, belt, and skirt all in different techniques and her facial coloration created in tapestry (fig. 10). A woman’s fingers must be incredibly dexterous to work on such a minute scale. Indeed, women cannot weave to perfection their whole lives; they must first spend years to gain mastery, and when failing eyesight or arthritis set in, they end a master weaver’s career. 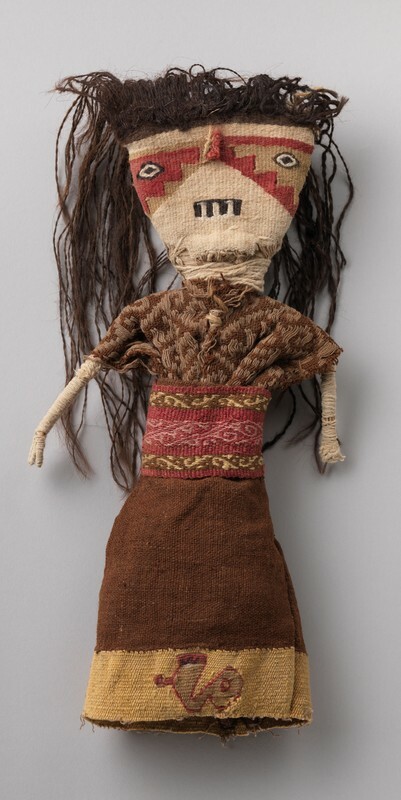 The Inka finest weavers, called the aclla, were precocious artists taken as children to live cloistered lives weaving for the ruler and for the state religion (Costin 1998, 134-135). The aclla were an extreme example of women who specialized in the finest textiles, but in earlier times and places weavers surpassed their contemporaries and forebears in feats of fiber working as well. There were really no limitations that were not overcome at some point in the Andean textile record. 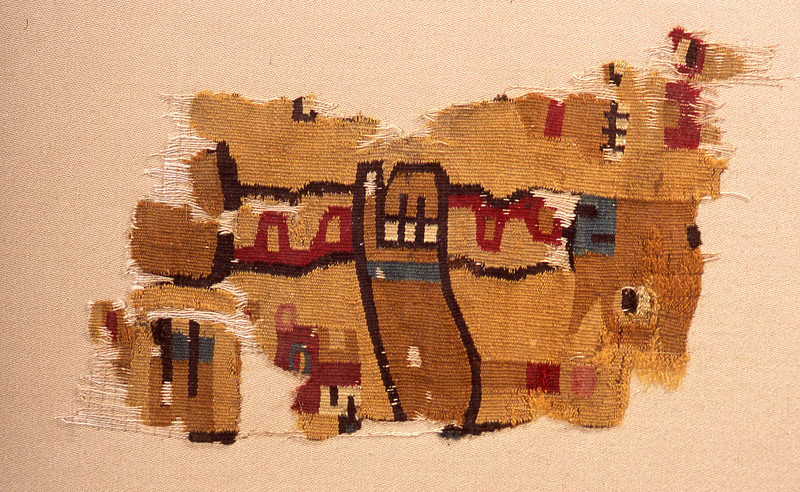 For instance, while textiles are naturally flat, the Nasca invented three-dimensional embroidery (fig. 11) which they practiced between ca. 200 and 300 AD (Sawyer 1997, 41). Figure 11. These fragmentary segments of borders were created in a rare three-dimensional embroidery technique; qumpi includes the most difficult methods known. Michael C. Carlos Museum, 2002.40.4A/C. Photo by Bruce M. White, 2016. The Wari built up a hat shape from only a few continuous knotted threads. Other pieces of thread inserted to form pile and added projections from the four upper corners (Frame 1990, 16). This is a very three-dimensional construction indeed. Even when making flat and relatively straightforward tapestry (plain weave, or simple over-under alternation, in which the sideways wefts completely cover the vertical warps), a Wari tapestry workshop could pack in over 150 wefts per inch. The small fragment with the hand and staff (fig. 13) has a higher than normal thread count, whereas the average tunic has 115-120 per inch (fig. 14). A complete four-by-eight foot Wari tunic consumed from at least six to an astonishing eighteen miles of thread and many months, if not years, of concerted group effort to achieve (Stone 1987, 60; Bergh 2013, 160). 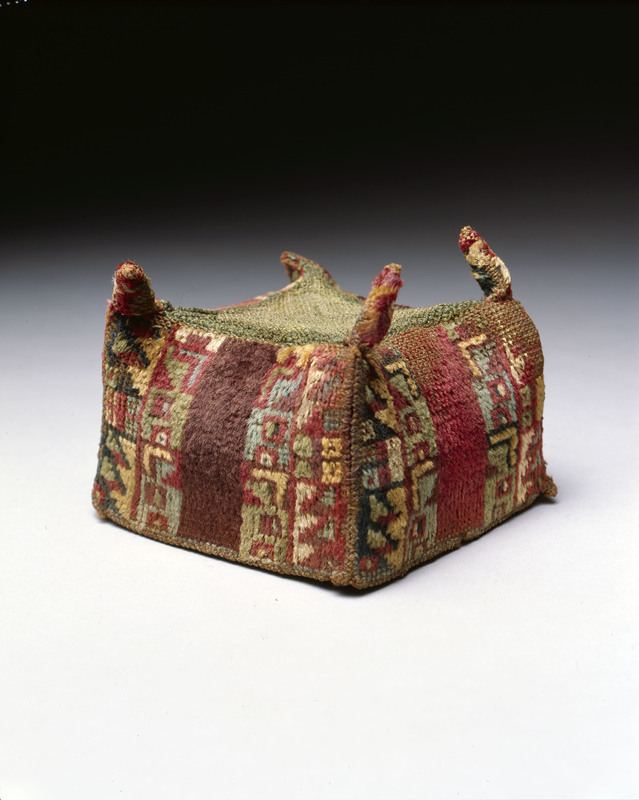 Since the Inka were even greater masters of tapestry — the sole surviving royal Inka tunic contains almost double the Wari thread count — we can be sure that time and skilled craft were inherent in qumpi. These thread counts go far beyond the need to make a solid piece of cloth with strong colors, as does the tight Figure-8 embroidery overlapping the joined seams. Wearing such an “over-determined” garment communicated the ability not only to garner but even to waste precious materials (Stone 1987, 92). Figure 12. A Wari man’s hat from ca. 600 AD sat on the head of a high-level administrator. Michael C. Carlos Museum, 2002.1.119. Photo by Bruce M. White, 2006. Materials with the greatest softness, sheen, and silky texture were employed in qumpi. Certainly, such fabric is more comfortable to wear, as elites have always preferred and been able to command across the globe and throughout time. 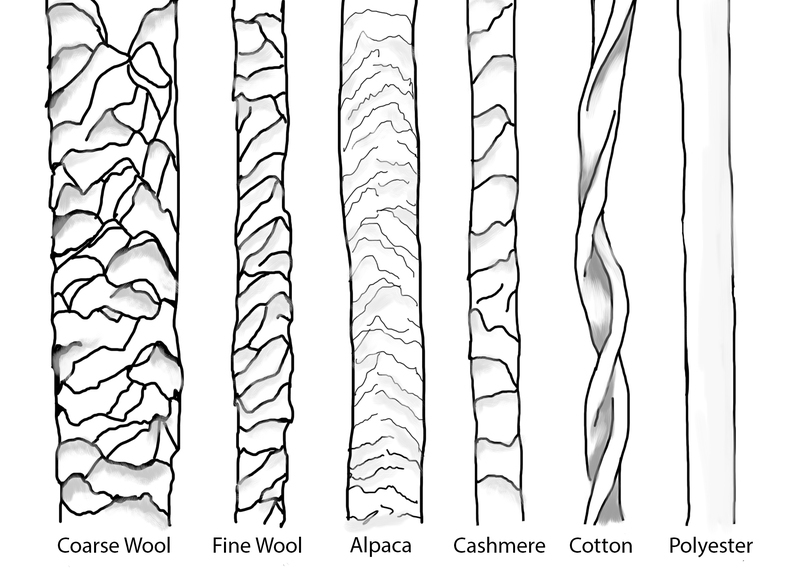 Specifically, the furry coats of the New World camelids are exceptionally soft compared to sheep’s wool and other fibers, as the drawing in fig. 14 shows. Alpaca hairs have proportionately more and flatter scales than even cashmere; small, flat scales cause less itchy friction when worn, yet provide nice purchase for spinning. 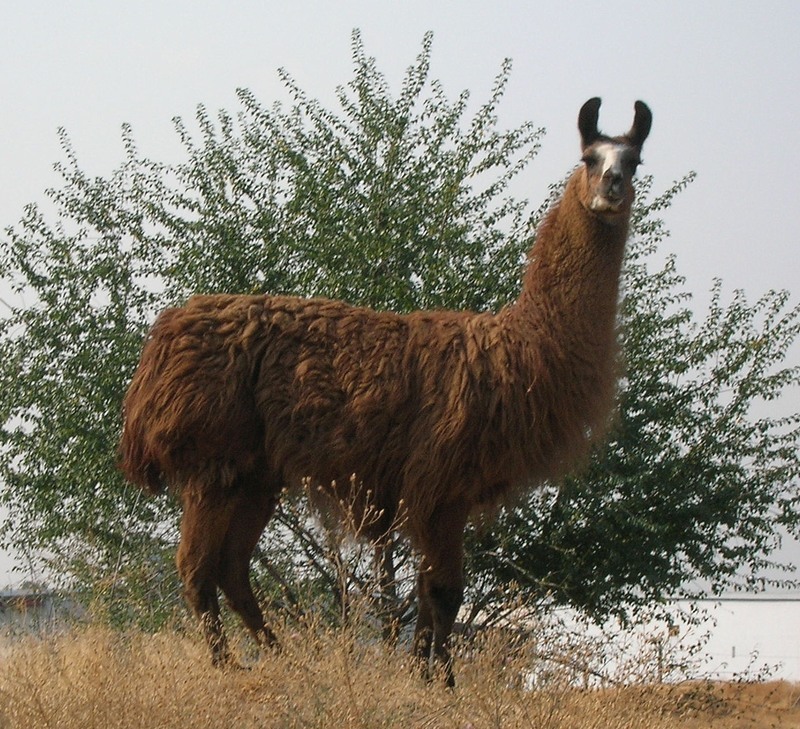 Perhaps counterintuitively, the rather poor diet available to camelids in the high reaches of the Andes (only ichu grass on the altiplano or high plains of Bolivia) produces finer fibers (Liz Butler, The British Llama Society, personal communication, July 2013). Thus, both soft and potentially very fine, camelid fiber makes an ideal high-status material for the best textiles. Spanish chroniclers confirm that the Inka ruler commanded the softest materials: he claimed to own every one of the undomesticated camelids known as vicuña (Stone 2012, 200). The national animal of Perú and the wildest and smallest of the American camels, the vicuña (Vicugna vicugna) stands less than three feet at the shoulder and barely four to the top of the head. It is uniformly chestnut in color, with a white fluff of chest hair and other white areas on the belly and inner legs. Its fur is the softest, silkiest of all the four American camel species, but there is little of it to be had and the animal is hard to capture. The Inka and people still today form a large circle to entrap them; however, they are an endangered species at present. 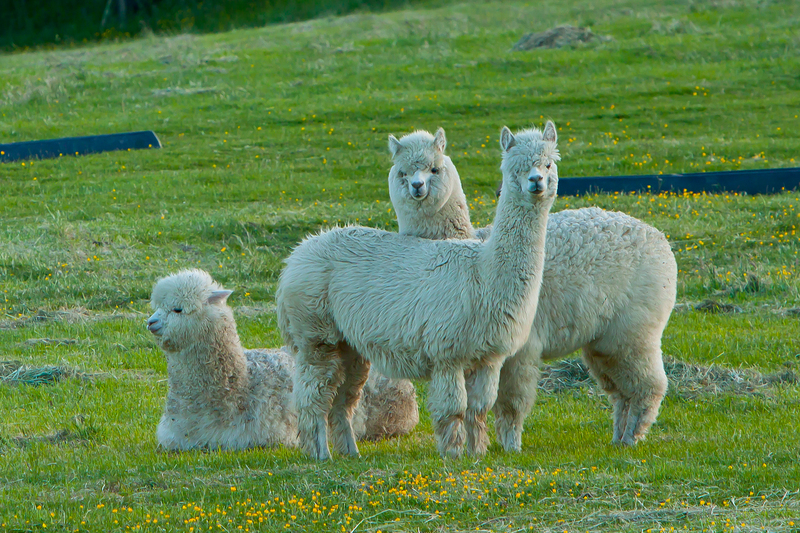 Recent DNA research suggests it is the ancestor of the alpaca (Wheeler et al, 2006: 340). The pacovicuña is a recent hybrid of the alpaca and the vicuña that possesses large quantities of superior fur. Figure 13. An above-average thread count, with 150 wefts per inch, this fragment shows how skillful Wari spinners and weavers were around 600 AD. Michael C. Carlos Museum, 2002.1.2. Photo by Michael McKelvey. Slightly larger than the vicuña, at three to almost four feet at the shoulder and five to the top of the head, the wild guanaco (Lama guanicoe) is thought to be the ancestor of the domesticated llama (Wheeler et al, 2016, 2578). Like the vicuña, its coloration is chestnut with white below; however, it does not have a chest patch and its hair is soft but not quite as silky. Again, little fiber can be gained from these wild animals that flee from humans as swiftly as deer. They largely inhabit Patagonia today and are endangered, like the vicuña. The llama (Lama glama) is the largest of the four camelid species of the Americas. Standing up to five foot nine at the top of the head, it would seem large enough to ride; however, its musculature is only suited for carrying about eighty pounds, which must be evenly distributed down and across the back in saddle bags. If overloaded, the animal will simply lie down and refuse to get up (and may well spit!). Thus, although nominally “domesticated,” they behave more like cats than dogs, with the pack following the lead animal that is being persuaded by the herder to obey. 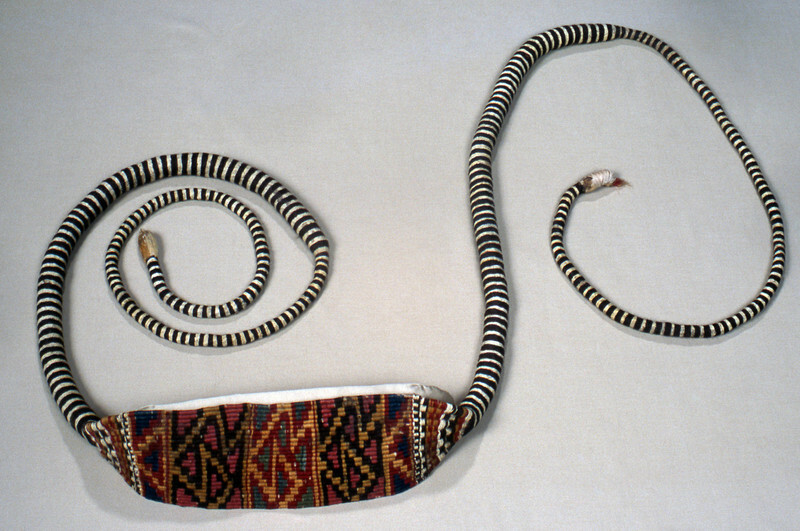 Early, Inka, and modern herders use leadlines and versions of halters to convince them to comply. Figure 14. 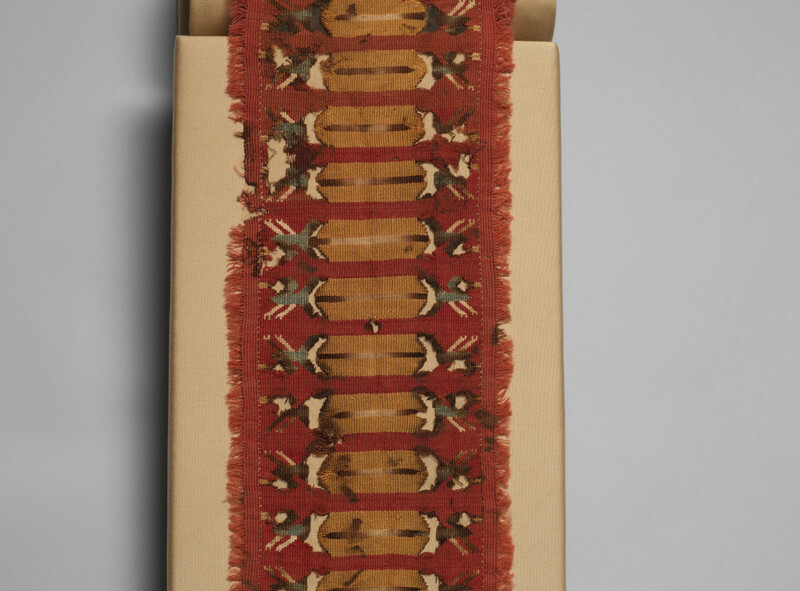 Only a small portion of a tunic that was originally four by eight feet (folded to be four feet square on a side), this fragment includes the typical thread count of Wari tapestry shirts, around 115 wefts per inch. Michael C. Carlos Museum, 2002.1.127. Photo by Bruce M. White, 2016. Yet the llama is the main reason that humans could settle and prosper at the high altitudes and varying ecosystems of the Andean region. Like the buffalo to the North American indigenous peoples, the llama provides almost everything needed: dung for fuel, hair and body warmth during the cold nights, sinews for ties, meat for food (after the productive years are over), and transportation of food, fiber, and other trade products from zone to zone. Surefooted due to their two-toed feet, they can walk for months at a time, and even climb stairs, which are part of the vast Inka road system (the world’s largest archaeological monument, a part of which is now is a World Heritage site). Their split muzzle allows them to crop grass very short and their slow heartrate helps with altitude. In short, they are perfectly adapted to their world (Ochoa 1979, 88). The alpaca (Vicugna pacos) stands about three feet at the withers and is by far the camelid with the most fur, which is very silky and easy to spin into warm and lustrous cloth (like cashmere only heavier). Like the other camelids, its hair takes dyes very well, since the many scales on each hair allow colorants to penetrate the shaft. White alpacas are and have been prized since their fur can take any color. They are sheared every two or three years and in a lifetime of only about twelve years one animal produces about twenty-two pounds of useable fur, a relatively small output. However, in a textile-centric society and tradition, it has always been considered well worth the effort. Figure 15. A comparison of different fibers as seen under the microscope shows that alpaca has the most numerous and flattest scales, making it softer than other wools. Cotton’s cellulose nature gives it a smooth surface that is both soft and resistant to dyeing. Drawing by Georgia Clark. 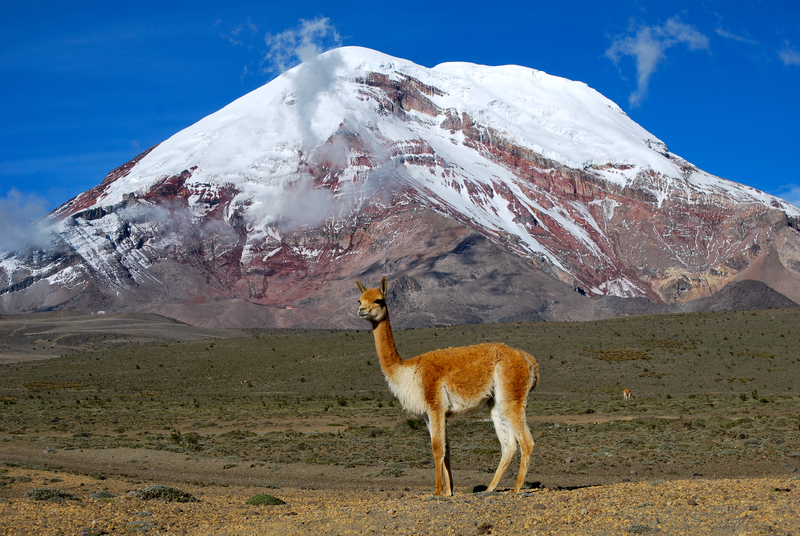 There are at least two other silky-haired Andean animals whose fur exceeded the softness even of vicuñas. 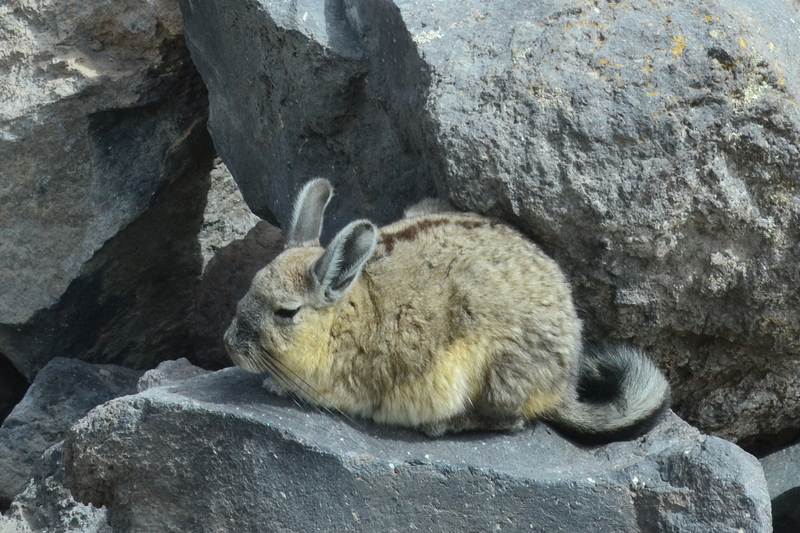 A relative of the chinchilla, the vizcacha (Lagidium viscacia/peruanum) resembles a large rabbit, but has shorter ears and a bushy curled tail. It lives between the treeline and the snow line and ranges from grey to brown to reddish (Werner, Ledesma, and Hidalgo 2006). Its short fibers are difficult to spin, especially to get the thread started as the fibers do not overlap that much. However, wrapping the loose fur in a cloth and rolling it can help impart the beginning of spin (Andrew Hamilton, personal communication, June 2016). Vizcacha certainly would have been a sought-after fiber for luxurious royal robes. Figure 16. The vicuña is wild and its fur is the softest of the four American camelids, which are the ancestors of the camel and dromedary. Photo by David Torres Costales, licensed under CC BY-SA 3.0. Neither the fur of the vizcacha nor that of the bat has yet been identified in the textile record; however, bat hair is mentioned by the Spanish as a royal material. Astonishingly, Pedro Pizarro mentions that the Inka ruler Atahualpa commissioned a mantle of spun bat hair (Cobo 1979, 245). Though made up of very short fibers, under magnification bat hair reveals jagged contours that would allow it to be spun, each filament interlocking with the next (Science Photo Library, “A Close Look at Hair”) Bats can indeed be brushed; however, the amount of time and effort involved as well as the number of bats necessary to catch in order to produce even a small mantle is staggering to imagine. Such a strange garment would have been a dull brownish grey, but again other viewers likely would have known that the odd-looking textile was made of the ultimate fiber. Figure 17. 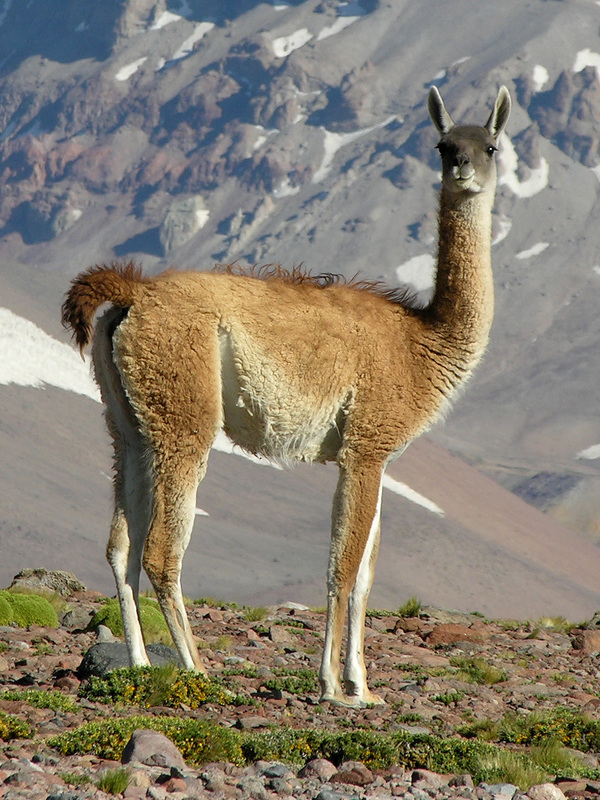 The guanaco, one of the two wild American camelids, does not have fur as soft as has vicuñas, and are the larger of the two. Photo by “XXXX,” licensed under CC BY-SA 2.0. Inka and pre-Inka art-cloth generally feature the brightest and most varied colors possible, ones that are obvious from both near and far. This polychromy shows the absolute mastery of natural dyes (fig, 21), which the Andean textile record demonstrates from earliest times to today. The modern country of Perú contains most of the known eco-zones in the world (Burger 1992, 12); in all of them different plants prosper and so too do distinct colorants. The wealth of plants that can produce yellows, greens, and browns is such that scholars have not been able to isolate them in finished textiles (Boytner 2006: 48-49). However, the most prestigious colors, red, blue, and their combination as purple, can be identified more easily. Whether we ultimately identify them all or not, indigenous knowledge and experience over time was needed to achieve strong colors, consistent results, and sufficient quantities of top-color thread. Andean dyers have always been ethnobotanists as well as artists. Figure 18. The llama is one of the two domesticated American camelids and the largest of the four types. Photo by Greg Goebel, licensed under CC BY-SA 2.0. A particularly strong red dye made from female cochineal insects (Dactylopius coccus) comes almost exclusively from the Americas (see fig. 21, five leftmost skeins). Cochineal was the focus of an entire exhibition at the Metropolitan Museum of Art and an accompanying catalogue by textile expert Elena Phipps (2010). She claims, “Red – associated with blood, fire, fertility, and life force to many cultures throughout the world – has always been one of the most highly prized colors, in part because it is among the most difficult to achieve.” (ibid., 5) This is due to the fact that very few of the world’s plants yield red. It is also because the insect and its host, the nopal or prickly pear cactus (Opuntia), have to be assiduously cultivated, tended, and harvested, prepared, and traded or shipped. (ibid., 14ff). Over 70,000 insects are required to produce one pound of dye. Phipps concludes, “Cochineal is a humble insect with a long and glorious history, and the treasures dyed and painted with its brilliant red hues bear witness to the contribution it has made to art and commerce throughout the world from antiquity to modern times” (ibid., 46). Figure 19. The alpaca is one of the two domesticated American camelids and yields the most abundant fur of the four types. Photo by Phil Long, licensed under CC BY 2.0. Called macnu in both Quechua and Aymara, grana by the Spanish, cochineal makes a distinctive scarlet red (from carminic acid) for the first threads dipped in a strong dyebath. As the dye bath weakens, pinks are achieved. With additives, however, cochineal can also produce blues, black, purplish, and orangish colors, making it a very versatile dye (ibid., 10; 15, fig. 20). That it can transform into other colors would have been striking in ancient times even more than it is to us today, especially since blue and purple are the other top colors in the value system. This makes it more like indigo, which also dramatically changes from one color to another (see more on the indigo dyeing process below). Unlike indigo, however, cochineal, a contact dye, is a relatively easy dye to accomplish: grind up the bodies of the dried insects, sprinkle the powder into the warm water, and place the thread in, stirring it around to get even dyeing. It is also a rather strong dye, consistently giving the same scarlet and pink (except for some sensitivity to the acidity of the water used [ibid., 10]). Indigo is not consistent in any way, so cochineal has certain advantages in that lesser specialists can achieve results and usually good ones, especially on animal fiber. Cotton fibers are more resistant to dye as the fibers are made of cellulose (fig. 21) and almost impenetrably smooth, unlike the scales of camelid fibers that let colorants into their shafts. Figure 20. The vizcacha is a member of the chinchilla family and likely provided Inka royalty with consummately soft yarn for their garments. Photo by Jorge Ara Saldías, licensed under CC BY 2.0. The Inka, while not scientifically identifying it as cochineal, claimed this top red dye for themselves and for special occasions. The legendary founder of Cuzco, Mama Wako, was said to have emerged from the origin cave at Pacaritambo wearing a red dress (Phipps 2010, 22; fig 37). Inka nobles and royals followed suit, including the ruler whose crown was a red fringe called the mascaypacha (ibid., 24). At the most important sun festival, Inti Raymi, all Inkas wore long red tunics down to their feet (ibid.) Usually such a length was reserved for women’s clothing, as we have seen in the “long dress” discussion, so the participants may have been taking the role of Pachamama to balance the sun/masculine element and create the ideal warmiqhari, woman-man, structure. It also may be germane that only the female cochineal insects yield red dye. Red and women, who bleed repeatedly for much of their lives, are a natural association. Elite status may thus be added to the configuration of the Feminine, dresses, red dye, and all space/time. Figure 21. 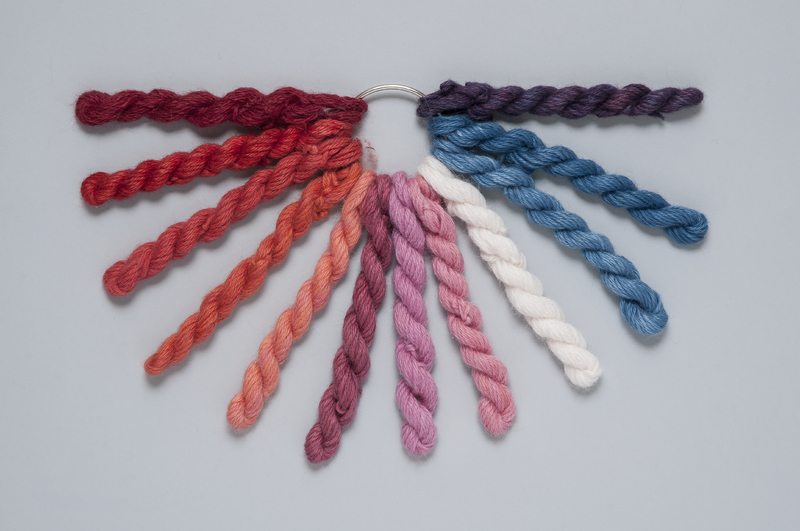 The many shades of indigo blue and cochineal red take well on alpaca yarn. Courtesy of Rebecca Stone. Beyond Phipps’ work on cochineal as high status, archaeologist Ran Boytner clearly demonstrated at the Lambayeque site of Pacatnamú that cochineal reds were favored by elites living in the tall, elaborate structures found at the site. By contrast, less intense and rustier red dyes such as Relbunium were mostly used by commoners who lived below and outside the special precincts. Access to cochineal was clearly restricted and Boytner concludes “...it is possible that dye choice was not a technical decision but an informed sociopolitical one. Cochineal was a dye reserved or the use of the elite, while commoners typically used Relbunium” (Boytner, 65). Boytner’s team determined this correlation by testing only textiles with provenance within Pacatnamú, narrowing down the factor of elite status in relation to which dye was included, ruling out other possibilities such as gender or time period. The brilliant cochineal-type scarlet on the Carlos Lambayeque tunic fragments supports his conclusions (figs. 22a,b). In light of the Quechua terms under consideration, it is highly likely that cochineal was used on qumpi and other dyes on awaska. Figure 22a. 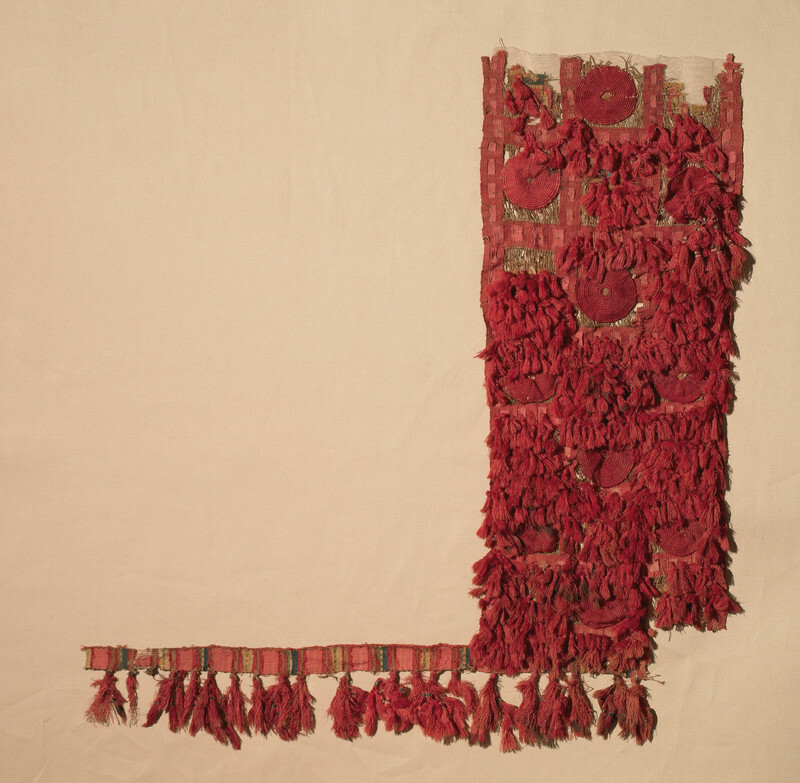 Extravagant use of cochineal characterizes the clothing of elites at the site of Pacatnamú; this example of fragments of a man’s garment (see further discussion in Dialogues of Thread under ukhu) Michael C. Carlos Museum, 2004.64.1A (larger fragment). Photo by Bruce M. White, 2008. Figure 22b. Michael C. Carlos Museum, 2004.64.1B (smaller fragment). The other prestige dye and resulting color was indigo blue. The addition of even a little touch of blue elevated any textile into qumpi, I would argue. This is because of many factors particular to this obstinate and changeable dye, all of which must be mastered each time a dyer attempted to make fiber blue. It resists adhering to cotton, making brilliant blue coloration all the more impressive. Indigo is a dye that does not really penetrate fibers, but rather sits atop their surfaces. Therefore, since cotton is a smooth-surfaced cellulose fiber indigo finds even less purchase (see fig. 21, rightmost three skeins). Yet Andean dyers, like spinners and weavers, were capable of overcoming any technical challenges that might arise. Indeed, these textile artists seem to have thrived on conquering any determinism set by the medium (meaning doing anything that one might believe could not be done, such as defying the warp and weft grid, cloth’s inherent flatness, and so on, as previously discussed). Figure 23. 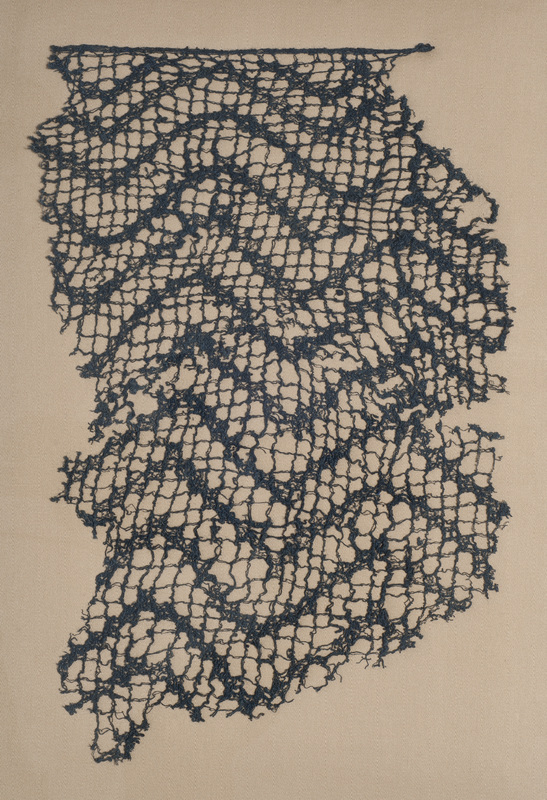 This fragment of a cotton woman’s headcloth has been dyed with indigo, the deep color showing it was repeatedly and successfully dipped by a master dyer. Michael C. Carlos Museum, 2002.1.52. Photo by Michael McKelvey, 2017. Figure 24. 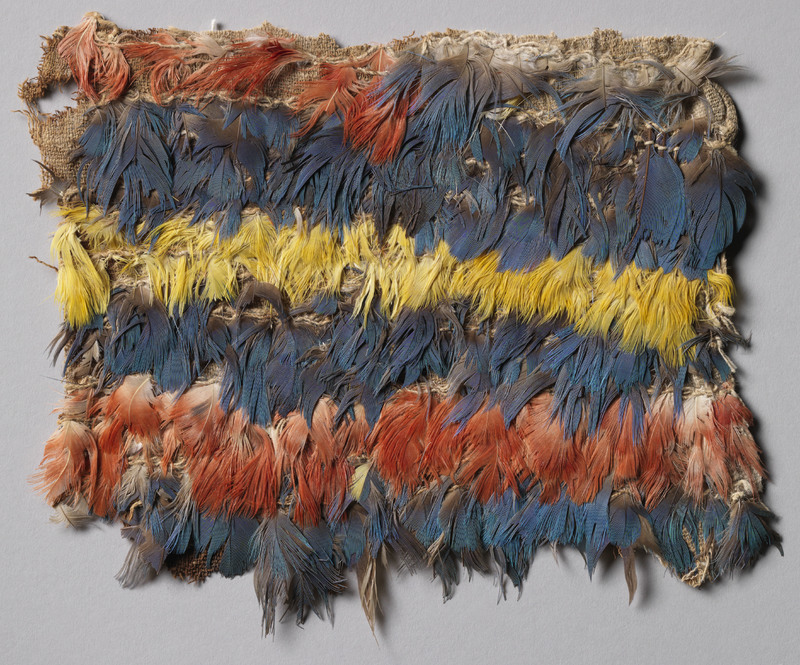 This part of a miniature featherwork tunic includes stripes of three bright colors, one of the main reasons this form of fiber art was so highly valued as qumpi. Michael C. Carlos Museum, 2012.35.1. Photo by Bruce M. White, 2014. One can now appreciate how tricky it truly is to achieve blue using indigo, especially the darker shades, and how this would make the value of blue soar. Figure 25. Since “imitation is the sincerest form of praise,” this tapestry version of featherwork establishes the ancient hierarchy of value, with featherwork at the very top. Michael C. Carlos Museum, 2002.1.61. Photo by Bruce M. White, 2016. In line with the Andean preference for textiles with maximum color, shine, and softness, perhaps the very highest expression of qumpi is featherwork (fig. 24). The ground cloth is not special, being undyed plain-weave cotton with a relatively low thread count. Thus, for once the cloth is not the most important part, but merely the vehicle for the bright tropical bird feathers that to cover it entirely. This demonstrates that the feathers take precedence over the cloth itself, as well they should having come from the exotic and far-distant eastern rainforest, trekked over the high peaks, and finally united with coastal cotton cloth. The effort that went into this combination of materials ranks among the most arduous in this history of Andean trade. Another clear indication that featherwork reigns supreme is that other qumpi techniques, particularly tapestry, actually imitate it in great detail (fig. 25). Though inevitably simplifying the overlap of feathers in rows and spacing them out across the cloth more than in real featherwork, the various parts of feathers have been observed and rendered carefully. 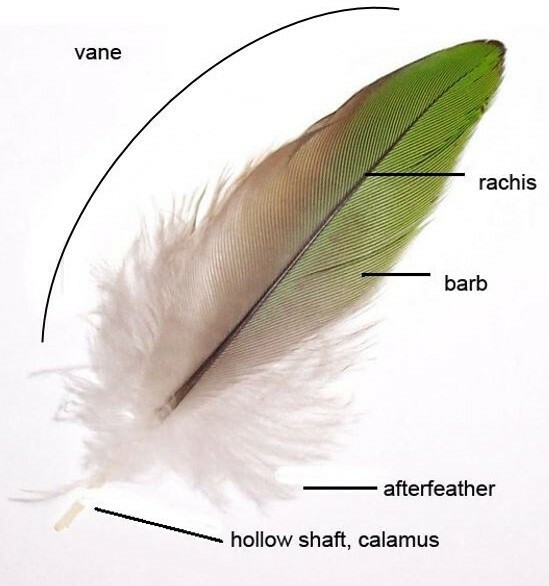 Here the rachis or shaft is delineated and the parts of the feather near the bird’s skin (called the “after feathers”) are shown accurately as a different color from those nearer the tip. Figure 26b. Detail of Michael C. Carlos Museum, 2006.24.1. Photo by Bruce M. White, 2013. Figure 26b. Drawing by Georgia Clark. Though another piece (fig. 26a) does not depict featherwork itself, it features one large feather forming a tail shared by two blue birds (fig. 26b). Here the artist has captured the way in which a macaw feather’s rachis tends to change color from the quill (or calamus, the exposed shaft toward the bird’s skin) to the end. This effect is replicated ingeniously by using tie-dyed wefts that gradually shift from dark to light and back to dark. 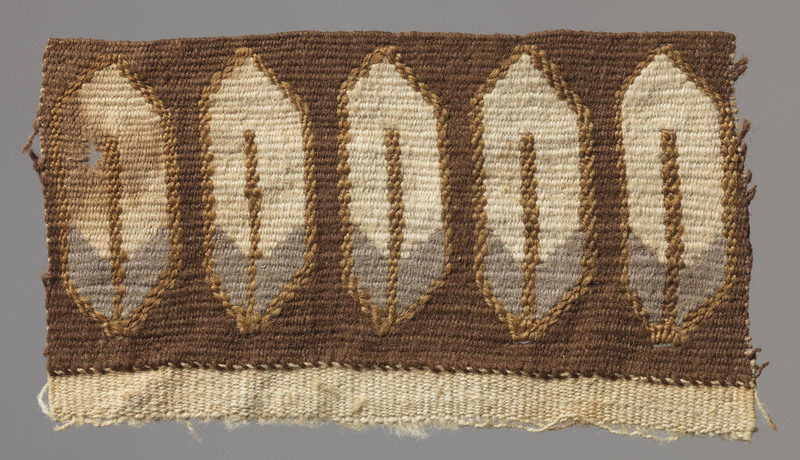 The imitation of featherwork is one of many examples in which various types of qumpi refer to one another (for instance, in the Museum of Fine Arts, Boston, a Wari feather tunic depicts tunic wearers [Stone-Miller 1994, 254]). These are indications of a highly valued, completely explored, self-referential cultural and artistic category, as would be expected in a tradition that created superlative cloth the Inka called qumpi. Figure 27. A diagram of a tropical bird feather can be compared to the woven ones in figures 25 and 26. Image courtesy of JoJan, licensed under Free Use.